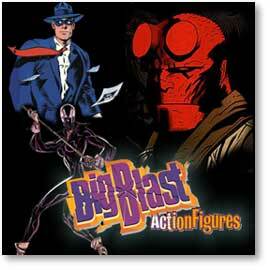 Fans rejoiced when Graphitti Designs announced that they would be continuing their Big Blast action figure line with Mike Mignola's Hellboy, Will Eisner's The Spirit and Matt Wagner's Christine Spar incarnation of Grendel. But now it's been so long since the figures were first announced that some were worried that these figures might never see the light of day. Well, fear not. Raving Toy Maniac spoke with the folks at Graphitti Designs and confirmed that that these much anticipated figures are still in the works, and are now scheduled for a Summer 2000 release. Big Blast figures stand around 8 inches tall and feature generous amounts of articulation. Couple that with terrific sculpts and classic characters and you've got a recipie for fan favorite figures.